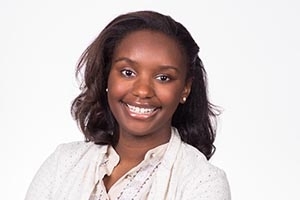 Seniors Rising: Three Kogod Students Awarded for Business Commentary | American University Washington D.C.
Photo: Winter Brooks, one of three Kogod students to win a writing award and scholarship money. The nonprofit Executive Leadership Council has recognized three students at American University's Kogod School of Business. Winter Brooks, Rachel Fogg, and Genever Oppong are all rising seniors at Kogod, and their essays were honored with the "excellence in business commentary" distinction. The awards, given to outstanding African-American undergraduates, include scholarship money and access to networking contacts and events. When Winter Brooks composed her award-winning ELC essay, she pondered how innovative companies can recruit millennials. She drew on the experiences of her peers, and what she learned in her Kogod classes. "I wrote it from the angle of what I was looking for as a student," says Brooks, a business administration major with specializations in marketing and information systems/technology. "Just that emphasis on diversity, that emphasis on curiosity. Being able to not just work to make money, but also to work to make a difference and have an impact." Brooks is personally hoping to use business for positive social impact. Born and bred in Detroit, she eventually wants to open her own marketing consulting firm there and empower local businesses to navigate the new economy. Brooks is already doing well and giving back: This summer she's working in Ann Arbor for Google, a position that enables her to assist minority-owned small businesses. Brooks grew up in a low-income household in the east side of the city. "My parents worked to never make me feel like I couldn't go to college, even though so many people around me didn't," she says. Brooks got a scholarship to attend Cranbrook, a private boarding school in Bloomfield Hills. It was academically stimulating, she says, but moving to a wealthy suburb brought culture shock and stress. She got into AU's Frederick Douglass Distinguished Scholars program, and she says that experience changed her life. "When I came to college, I was feeling a lot of insecurity," she explains. "Coming into this [FDDS] program with such high expectations-but also solutions and ways to exceed those expectations-was really reassuring." Brooks highlights the mentorship she's received at Kogod, and she notes how the school helped her during a trying time. Brooks is a member of Alpha Kappa Alpha, a predominately African-American sorority recently targeted with a racist hate crime. She said multiple Kogod professors reached out to offer their support. "That really made me feel welcomed and appreciated. It felt like people cared," she says. With her peers, she got involved in an "adopt-a-school" initiative to tutor students at a D.C. elementary and middle school. They even brought some underprivileged kids to AU, where they ate at Terrace Dining Room and explored the campus. "One first grader came up and said, 'I can't wait to apply to American,'" she recalls. "I hope that they remember that experience and know that AU does want them here." Mindful of the guidance she's received, Brooks is committed to helping the next generation. "It's always been important to me to pay it forward, because I've just been given so many opportunities. My life could have gone a completely different way-if I hadn't been given a full FDDS scholarship, if people hadn't taken a chance on me." While preparing for college, Rachel Fogg was unsure about a major. She ultimately wants to start her own business or nonprofit, but she's also intrigued by how people and societies operate. After consulting with an older friend, he conveyed to her a certain truth: a business is an organization of people. "You can learn a lot about people in society within business," she says now. Fogg made her decision, and she's currently an accounting major and a minor in finance. This summer she'll be interning at PricewaterhouseCoopers (PwC) in New York City, and her ELC essay dealt with the process of landing the position. During an interview, a PwC partner was candid about the company's diversity shortcomings, but he described PwC's plans to attract more people of color. "He wasn't trying to sell me on his company. He was just being honest," she says. "That's how I started my essay. That I wanted to work with honest people, where there's transparency about what the company is doing." Born in Ethiopia, Fogg was living in an orphanage when she was adopted by an American family. She was five years old when she first came to the U.S., and she was raised in the small town of Hartford, Vermont. She took part in an English as second language program, while also adapting to an entirely different culture. "It was such a huge transition," she notes. "I was very involved in school. Early on, I loved learning. I played sports." Upon looking at colleges, AU's Arboretum & Gardens was a selling point, reminding her of Vermont's trees and natural beauty. On campus, she's a member of the co-ed business fraternity, Alpha Kappa Psi, and she's also worked at the Kogod Center for Career Development. Long term, she may return to Ethiopia to launch an education-economic development organization. "One thing that I've come away with here at Kogod is that business, if done well, can have the ability to lift a community." All things considered, 2017 has been an eventful year for Fogg. Through expensive paperwork and an extensive process, she became a U.S. citizen in February. Genever Oppong remembers feeling quite ambitious when she started at AU. During a first-year business class with Kogod Executive in Residence William Bellows, students were sharing their individual career plans. When it was Oppong's turn, she declared her desired position: CEO of a Fortune 500 company. She recalls Bellows being a bit stunned, but he also became a mentor to her. While she has many miles to travel before heading a corporate board room, the early signs are promising. She just won this award, which came with $15,000 in scholarship funds. And she's now spending her second summer working a plum internship at Goldman Sachs in New York City. She's also earned a special Goldman Sachs scholarship for another $15,000. Not that she hasn't dealt with adversity. "I am an accounting major, and it's definitely challenging. So I would also attribute my academic success to the support I received from my accounting professors," she says. And that scholarship money was sorely needed, given some difficult financial constraints she's facing. Over the years, Oppong has learned the importance of resilience. "I pushed myself to be the very best version of myself. Every year, I kind of looked at myself and said, 'OK, you accomplished this. This is great. What else can you accomplish? And how else can you help other people?'" She emphasizes that last part-keeping the door open for students behind her. "I've had people come up to me and ask for mentorship advice and ask for career advice, and I think for me that's been the most meaningful part of this experience," says Oppong, who's also a member of Alpha Kappa Psi. Oppong is a daughter of Ghanaian immigrants and she grew up in Newark, New Jersey. She lived in a high-crime area-an environment that seems even more troubling to her in hindsight. "We were very accustomed to gang violence," she says, "but fortunately enough my parents made sure that education was the main priority." She later came to AU and found her niche. She's held other valuable internships, working as a development intern for the Trust for the National Mall and as a teen ambassador program mentor at the Smithsonian Institution. "I think there's something that separates AU from a lot of schools; it's that small community feeling. I essentially feel that Kogod is my family and it's my home," Oppong says. Her ELC essay was about the statue "Fearless Girl," also called defiant girl, which stood in front of the Wall Street Bull and became an Internet sensation. "Fearless Girl" symbolized the need for corporate America to hire more women in leadership positions, she says. "That piece resonated with me on so many levels, to see such a small girl standing up to the Wall Street Bull. It's kind of a corporate story of David and Goliath," she says. "I saw myself in her."